CHICK PEA AND CHOCOLATE DUMPLINGS. Did you know that ancient Romans – if poor – were not allowed to cook? Such was the danger of fires that the plebeians were expected to eat in a tavern rather than cook on a rickety brazier. Italian farmers had basic cooking facilities until relatively modern times. Most food was cooked in a clay or copper pot over an open fireplace which was also the only heating system of the house. That’s why the Italian tradition is rich in fried sweets. They can be cooked easily and in amounts suitable for large families. This is a fabulous recipe from my friend Luana. 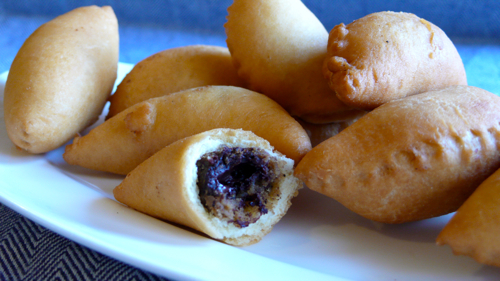 The “cauciuni” are fried dumplings that are prepared in Abruzzo for Christmas. The name probably means small “calzoni”- of the pizza variety -, but to us Italians it sounds like “big kicks”. The filling is a relatively extravagant concoction combining the peasant beans and nuts with the noble coffee and chocolate. Unlike real life, the combination of social strata works very well. Make the dough in a food processor as explained for fresh pasta. Alternatively mix ingredients by hand in a large bowl, then turn the dough out onto a lightly floured surface and knead, adding more flour if necessary, until smooth and elastic, about 10 minutes. Place the dough on a table, and flatten it with a rolling pin until it is about 3 mm cm (1/8 inch) thin. Cut it into 5 cm (2 inch) disks. Knead the leftover dough, roll it again and cut more disks until all dough is used. Blend all filling ingredients and place a teaspoon of filling over each disk. Fold disks in half and seal pressing with your fingers along the round edge of each dumpling (see video below). Deep fry in hot vegetable oil until golden. Serve warm with a glass of Marsala or other sweet wine. I love the video — fantastic! And I enjoyed this piece of Roman history. I had no idea that plebs weren’t allowed to cook at home, but in a strange way, it does make sense. At first, it’s a bit hard to imagine garbanzo beans, coffee and chocolate mixing together well! But then again, I’m guessing the beans give the filling a rich texture. THIS is DIVINE!!! Thank you Luana for sharing…and to Letizia for the historical value! I cannot wait to make this recipe. This recipe is a keep for my files….from friends…and similar long lost recipes shared through the years from my own family. Thank you. Let us know who they come out! I can’t wait to see your version! Thank you for posting this video and stirring memories of so many years ago. Thinking more on this subject, I remember my grandmother telling me they used chestnuts at times instead of chick peas when she was a young girl in Italy. Also i don’t remember my paternal grandmother from Castiglione A Casauria, Pescara making these, but I do remember she made the jam-filled cuscini.